In this tutorial, you will learn about sets, creating sets, modifying them and some common operations in sets. How to declare a set? In the previous Swift Arrays article, we learned about creating array that can hold multiple values in an ordered list. But, if we have to make sure a list can hold a value only once, we use a set in Swift. Sets is simply a container that can hold multiple value of data type in an unordered list and ensures unique element in the container (i.e each data appears only once). Unordered list means you won't get the elements in the same order as you defined the items in the Set. The main advantage of using Sets over arrays is when you need to ensure that an item only appears once and when the order of items is not important. Values stored in a set must be hashable. This means it has to provide a hashValue property. This is important because sets are unordered and it uses hashValue is used to access the elements of the sets. All of Swift's basic types (such as String, Int, Double, and Bool) are hashable by default, and can be used as set value types. However, you can also create your Hashable Type in Swift that can be stored in a set. How to declare a set in Swift? You can create an empty set by specifying the type as Set followed by the type of Data it can store within < >. In the above program, we have declared a constant emptyIntSet of type Set that can store multiple values of integer and initialized with 0 values. In the above program, we have declared a constant someIntSet that can store sets of Integer without specifying the type explicitly. However, we need to write :Set when defining the variable, otherwise Swift will create an array for us. Also, as arrays, we have initialized the set with 1, 2 ,3 ,4, 5, 6, 7, 8, 9 values using the  brackets. As you've learnt, when you try to print the values inside the set as print(someIntSet), you will get the results in a different order than you have defined the items in the set because it stores value with no defined ordering. Therefore, each time when you access the order changes. In the above program, we have defined a duplicate value ab in the set. And. when we try to access the value inside the set using print(someStrSet), the duplicate value is automatically removed from the set. Therefore, set guarantees unique elements/values inside it. You can also declare a set with your own custom Hashable type in Swift. To learn more, visit Swift Hashable. How to access set elements in Swift? You cannot access elements of a set using subscript syntax as arrays. This is because sets are unordered and do not have indices to access the elements. So, you need to access the set using its methods and properties or using for-in loops. In the above program, we get the val in different order than elements of a set because sets are unordered unlike arrays. In the above program, you can see the remove method returns an optional string. Therefore, it's recommended you to do optional handling as below. To learn more about optionals, visit Swift Optionals. How to add new element in a set? You can add a new element to a set using insert() method in Swift. In the above program, we used the set's insert() method to add a new element to a set. Since, sets are unordered, the position of the inserted element isn't known. Another main advantage of using Sets is you can perform set operations such as combining two sets together, determining which values two sets have in common etc. This operations are similar to the Set operation in Mathematics. The union of two sets a and b is the set of elements which are in a, or b, or in both a and b. The intersection of two sets a and b is the set that contains all elements of a that also belong to b. 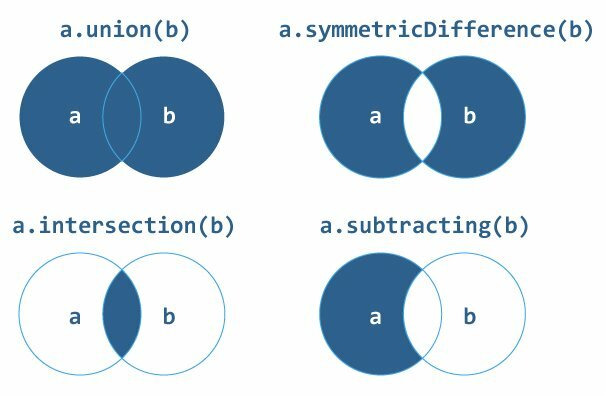 Therefore, print(a.intersection(b)) outputs a new set with values [7, 3] that are common in both a and b. The subtraction of two sets a and b is the set that contains all elements of a but removing the elements that also belong to b. Therefore, print(a.subtracting(b)) outputs a new set with values [5, 9, 1]. The symmetric difference of two sets a and b is the set that contains all elements which are in either of the sets but not in both of them. Therefore, print(a.symmetricDifference(b)) outputs a new set with values [5, 6, 8, 0, 1, 9]. You can use == operator to check whether two sets contains same elements or not. It returns true if two sets contains same elements otherwise returns false. isSubset(of:)This method determines whether all of the values of a set are contained in the specified set. isStrictSubset(of:) or isStrictSuperset(of:): This method determines whether a set is a subset or superset, but not equal to, a specified set. isDisjoint(with:) This method determines whether two sets have no values in common. isSupersetreturn true because b contains all of the values of a.
isStrictSubsetreturns true because set b contains all the element in a and both sets are not equal. isDisjointWithreturns false because a and b have some values in common. This property determines if a set is empty or not. It returns true if a set does not contain any value otherwise returns false. Example 7: How isEmpty works? This property is used to access first element of a set. Example 8: How first works? Since set is an unordered collection, the first property does not guarantee the first element of the set. You may get other value than 54. Similarly, you can use last property to access last element of a set. The insert function is used to insert/append element in the set. Example 9: How insert works? This function returns the elements of a set in reverse order. Example 10: How reversed() works? This property returns the total number of elements in a set. Example 11: How count works? This function removes and returns the first value from the set. Example 12: How removeFirst works? Similarly, you can also use removeAll function to empty a set.